It was the summer of 2008, and little did Arsenal fans know it, but the pillars of an empire were starting to wobble. Impacted by the brunt of the Emirates stadium debt, Arsenal had to change its model in order to pay off the debt. No longer was this a team competing for Premier League trophies; instead, this was a team looking to stay afloat in the top four, an accomplishment that today, would make Maurizio Sarri, Mauricio Pochettino, Unai Emery and Ole Gunnar Solskjaer feeling high and mighty. And so, in order to finance the stadium that they had moved into the previous year, Arsenal sold Thierry Henry, the greatest player in club history, to Barcelona. José Antonio Reyes as well as Invincibles starter Freddie Ljungberg would leave as well. This stadium debt would significantly hamper Arsenal in the transfer market, to the point where Arsenal had no choice but to sell their all-time leading goalscorer to the club that just a year ago, had ended their first shot at European glory. Rather than big-money, established players, Arsenal rebuilt with youth. First, it was Bacary Sagna and Eduardo arriving from Auxerre and Dinamo Zagreb respectively, as well as Kieran Gibbs and Nicklas Bendtner being promoted from the academy. The next summer, as another key player left for Catalonia, and as other club legends departed, Arsenal repeated their youth-focused cycle. Jack Wilshere and Wojciech Szczęsny were promoted from the academy, whilst Samir Nasri and Aaron Ramsey arrived from Marseille and Cardiff City. Today, Wilshere and Nasri play for Manuel Pellegrini’s West Ham United, while starts in goal for Serie A league leaders Juventus. Of those four, only Ramsey remains at Arsenal today, although after 11 years at the club, all signs point to him joining the latter in Italy on a free transfer this summer. When Ramsey does leave, he will leave behind a conflicted legacy. Perhaps it shouldn’t be so conflicted; perhaps a player of his skillset should never have divided opinion in the Arsenal fanbase. Whatever the case, while so many youth talents either fell through the cracks, disappeared, or left for greener pastures, Aaron James Ramsey became the player he is today and gave Arsenal fans unforgettable memories in what should be remembered as a glorious career in red and white. Born in Caerphilly, one of the larger counties in Wales, on December 26, 1990, Ramsey was birthed into a county where rugby was the preeminent sport rather than football. Born into a world of competition, Ramsey was never a slacker, and working hard in sport was part of his DNA. However, before dipping his toes into football, he was keen on rugby, and as an athlete, he was the Welsh School’s Athletic Association Pentathlon Champion in 2005, placing 4th in the whole of Great Britain. 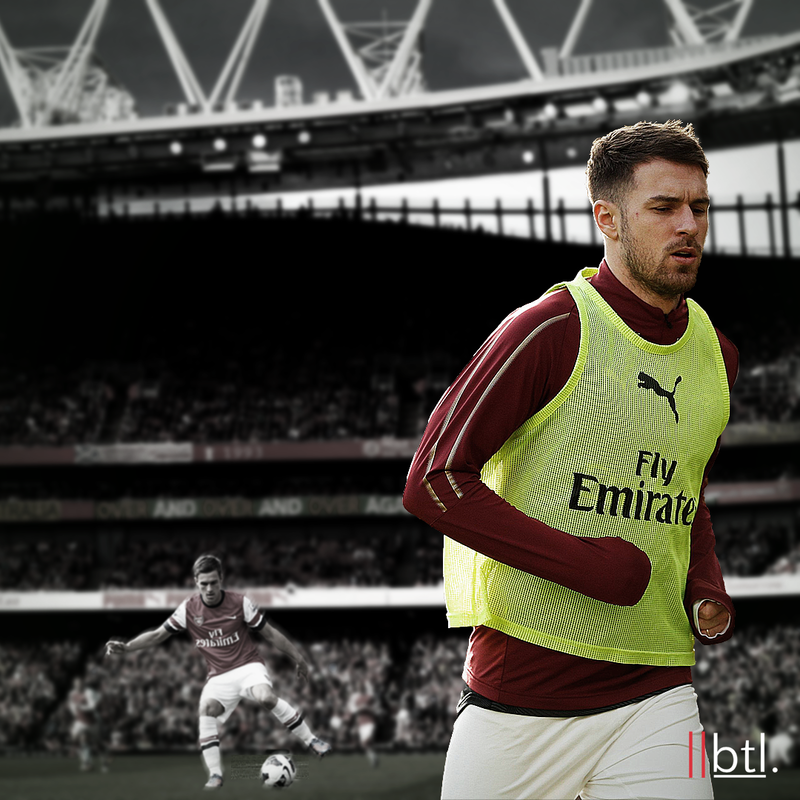 These activities are what could be said to have formed the hard-working style of play that has come to define Aaron Ramsey throughout his career. After impressing in an Urdd Welsh League of Youth/Hope, he was approached by Cardiff City, who beat off competition from Newcastle for the 8-year-old school boy, and he promptly worked his way up through the youth system. He made his debut against Hull City in 2007, becoming the youngest player to play for Cardiff. He went on to make 22 appearances the next season (his first in professional football) and played in the FA Cup final loss to Liverpool. Growing up as a fan of Manchester United, it would have been easy for him to have been swayed when Sir Alex Ferguson inquired about him and his availability. However, the pull of Arsené Wenger was irresistible. Wenger had molded youngsters like Cesc Fábregas and Henry into absolute world beaters, and it was no surprise that Terry Burton, then assistant manager of Cardiff, recommended he choose Arsenal. The first challenge was complete: at 17, Ramsey was playing for one of the biggest clubs in England. The next challenge was to get into Arsenal’s starting eleven. Whilst Wenger was well-known for not being afraid to give young players a chance, he doesn’t hand out starting appearances to youngsters either. One must display effort on both sides of the pitch, unique talent, and intelligence in order to play for Arsenal, all of which Ramsey possessed from the outset. Joining Arsenal for the fee of £5.76 million, the teenager arrived with lofty expectations. As more and more hallmarks of the Highbury era left, Wenger stockpiled promising talents from across Europe, in hopes that they would come to define the Emirates era. Few would pan out to become true leaders in the Emirates, but Ramsey wasn’t a flash in the pan; he was a shooting star. Exactly two months after arriving in London, Ramsey was handed his debut in a Champions League qualifier against FC Twente. With Fábregas injured, Wenger started the young Welshman in midfield alongside Denilson in the vital play-off. It was good enough for a 2-0 first leg victory, and Arsenal once again made it into the group stage. He would receive his league debut a month later, and in an group stage fixture at Fenerbahçe, he scored his first goal for Arsenal, becoming the fifth-youngest goalscorer in Champions League history. At 19, Ramsey was establishing a reputation as one of the most promising midfielders in the division, until February 27, 2010, a day that will live on in infamy in the hearts of Arsenal supporters. A day that sent stomachs churning, mouths agape, hands on heads. At the Britannia Stadium, Stoke captain Ryan Shawcross snapped Ramsey’s leg in half in a double fracture, breaking his tibia and fibula. A horrific injury that would signify a massive gap in development for Ramsey, as well as a gap in Arsenal’s central midfield. Suffering a setback like this at 19 leaves not only physical limitations on any player, but also a mental fragility. Arsenal’s players have suffered nasty injuries over the years, and between Santi Cazorla, Jack Wilshere, and Abou Diaby, none of them have recovered, neither physically, nor mentally, nor technically. That is, except for Ramsey. After 9 months on the treatment table, Ramsey recovered and was soon sent on loan to Nottingham Forest and back to Cardiff to regain match sharpness, all of which ran into 2011. He was prepared to fight his way into the team again, no matter what it took. As he dusted the cobwebs off from his injury, Ramsey could reflect on how gifted he was as a footballer and how fortunate he was to be doing what he loved most. It’s that kind of awareness that so many bright talents have lacked, as they have fallen off the path from stardom into the pit of obscurity. And so that was that, Ramsey was going to be the rubber-band man, the Rocky Balboa, the guy you just can’t knock down. No matter what, he was going to give it all he had to be the brightest prospect in Arsenal. However, as he returned, there was a new kid on the block: Jack Wilshere, coming off a fantastic performances against Barcelona. In the absence of Ramsey, Wilshere was thrust into the spotlight, as the new five-star talent of Arsenal. One might have expected the two to co-exist in midfield, but as more and more injuries popped up, Ramsey was deployed from central midfield to attacking midfield, right wing to left wing, and even right back. He wasn’t anywhere near as good in those latter positions, but he was a useful jack-of-all-trades, for the most part. Ramsey had an expected dip in form in the twilight of the 2010/11 season, and the following season, he was widely criticized for slowing down play, his sloppy pass selection, and his questionable decision-making. Against all odds and better judgement, Wenger kept faith in his man (and partly because Wilshere was never consistently fit) and kept playing him. He did have some inspired moments during the season though, and his work rate never slacked. Surely enough, Wenger’s leap of faith paid off. Ramsey’s form picked up in the beginning of the 2012/13 season and it was clear his game had moved up a tier. Arsenal backed him again by giving him a new long-term contract alongside the “British core” of Alex Oxlade-Chamberlain, Theo Walcott, Kieran Gibbs, Jack Wilshere and Carl Jenkinson. Among these, he’s the only remaining active servant of the club, with the former four departing for other English clubs over the past two years, and with Jenkinson even failing to start over Stephen Lichtsteiner. As talented as a footballer he is, he wouldn’t have established such a legacy without his relentless work-rate and unshakeable attitude. Not once in his career did any rumors surface of him wanting to leave or him causing dressing room problems. The man just wanted to sleep, train, and play for the Arsenal. The 2013-14 season was one of the most memorable periods of Ramsey’s Arsenal career, with ‘Rambo’ reaching another level playing in a double pivot alongside Mikel Arteta. He had developed an ability to ghost into dangerous goalscoring positions, and his impeccable technique never, ever let him down. Arsenal quickly trotted to the top of the table, as Wenger’s faith was repaid in his 9th year without a silverware. In the Champions League play-offs, he netted three goals over two legs against Fenerbahçe. The deadline day arrival of Mesut Özil only made him work even harder, and in this deep role, one that he was used to playing in during Arteta’s spells on the sidelines, he became more elusive to mark, becoming a dynamo in the box-to-box role. Such were his immense fitness levels and intelligent runs that Ramsey won Premier League Player of the Month for September, as well as Arsenal Player of the Month for four months in a row. With Ramsey in the heart of the team, Arsenal were playing scintillating football and dazzling from the top of the table. However, a cruel twist of fate struck once again, and Ramsey succumbed to a thigh muscle injury that would leave him out of action for over three months. By the time he returned in April, the title hopes were long gone, as Arsenal were leapfrogged by Manchester City, Chelsea, and Liverpool. Those three clubs would play out an unforgettable title race, whilst Arsenal watched from the sidelines, consigned to another 4th-place finish. The only thing left for Arsenal to play for was the FA Cup Final against Hull City. Wenger eased Ramsey back into the starting line-up, and he was in the starting line-up in Wembley, nearly nine years after Arsenal hoisted their last piece of silverware: the FA Cup against Manchester United. After Hull got off to an early 2-0 lead, Arsenal leveled the scoreline with late goals from Cazorla and Laurent Koscielny. Then, with ten minutes remaining in extra time, Ramsey crept in from the right wing to fire in the winner into the bottom right corner. It was a goal that reflected the best of Ramsey’s qualities: the elusive run into the box, the one-touch finish, the lightning-quick decision making. He pumped his fists in celebration while running around the corner, before collapsing onto the ground and celebrating with his teammates, as a wide grin emerged. It was a celebration that reflected excitement, relief, fatigue and jubilation. It was the culmination of years of hard work on the training ground, rising from the ashes from terrible injuries to deliver the club to glory. Deservedly, Ramsey was named Arsenal Player of the Season, although there will always be the nagging feeling of what could have been had he not gotten injured during the thick of the title race. Two more FA Cups would follow, including the 2017 FA Cup against Chelsea, in which Ramsey scored the late winner to clinch the trophy. In Wenger’s final season at the club, he was instrumental in Arsenal run’s to the Europa League semi-finals, with four goals against Milan and CSKA Moscow. As the Frenchman was preparing to leave the club, and as the Welshman’s contract situation dangled in the future, Ramsey was the club’s finest player last season, winning the ball back in dangerous positions, contributing in attack, and keeping the midfield ticking with nonstop running and fine passing. It’s almost certain that Ramsey will be playing in bianconeri next season, joining the likes of Dani Alves, Andrea Pirlo and Kingsley Coman as players who signed for Juventus upon the expiration of their contract. Should the deal go on as planned, Juve will be getting the ideal midfield partner for Miralem Pjanić, capable of performing in a double pivot while also apt at lining up alongside Pjanić and Rodrigo Bentancur in Allegri’s trademark 4-3-3. For too long has Ramsey been unappreciated despite consistently producing the goods at the Emirates, but it’s clear that the Italian champions haven’t overlooked his talents. It didn’t have to end like this. Just when Ramsey looked set to sign a contract extension, Arsenal pulled the offer off the table. Perhaps the club’s decision could be attributed to their actions in January 2018: the Mesut Özil contract extension, as well as the signings of Pierre-Emerick Aubameyang and Henrikh Mkhitaryan severely inflated the club’s wage bill, so it’s no surprise that Arsenal felt it necessary to let him leave on a free. According to Italian journalist Fabrizio Romano, Ramsey is set to make £140,000 a week at Juve, as the club’s second-highest earner behind Cristiano Ronaldo. When Ramsey does leave, it will be the end of an era for Arsenal. As the club’s longest-serving player, Ramsey has overseen turnover and triumph, heartbreak and humiliation, the worst of times and the best of times. He was there when Manchester United rolled them over 8-2 in 2011, but he was also there for the salvation at Wembley in 2014. In fact, with Ramsey, Laurent Koscielny, Nacho Monreal, Carl Jenkinson and Mesut Özil likely to leave this summer, not a single player from the 2013/14 team will remain on Arsenal’s squad. The memories of that season–the early title chase, the devastating injury, the humiliating 0-6 loss to Chelsea, the redemption against Hull–all of that will fade to black come July 1. Perhaps he wasn’t the luckiest with injuries, but Ramsey fulfilled his potential and left an unforgettable legacy at Arsenal. He did not push to leave for greener pastures like Cesc Fabregás or Emmanuel Adebayor, he did not fail to capitalize on his talent like Carlos Vela or Nicklas Bendtner, he did not fail to recover from horrific injuries like Abou Diaby or Tomáš Rosický. When today’s Arsenal fans tell their grandchildren of Aaron Ramsey, they won’t feel regret or disdain. They will tell them of a boy who handled the hype, who battled back from injuries, who ended the trophy drought, and who left a man. They will reminisce about the lung-busting runs, the stunning goals, and the never-say-die mentality. More than anything, they will tell the story of a man who served as a beacon of light for Arsenal when everything seemed dark after the Emirates move, a man who got knocked down twice only to rise three times and guide Arsenal to three FA Cups. They will tell of a man who didn’t give up until his work was done.